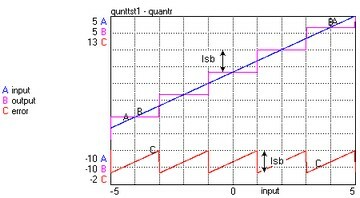 This model can be used to represent quantization of an input signal. It rounds the input as shown in the graph below. The quantization interval is specified by the least significant bit (lsb). The maximum output error is half a least significant bit. Compare this model with the model Quantisize-Truncate which represents quantization by truncation. Truncation results in a maximum error of a least significant bit.